Each Granite utensil is innovative by nature. It combines innovative cutting-edge design with excellent materials and state-of-the-art technology. Design and appearance refer to natural materials: wood-look handles, black forged body and granite coating on the inner surface. The forged body features a magnetic base, which ensures excellent heating over induction cook tops and contributes to the even distribution of heat at the bottom of the vessel. The special geometry of the body ensures more rigidity than ever before. The culinary effect is perfect and the cookware practically never warp. Granite series utensils feature exciting non-sticking properties. The internal surface of Granite utensils is made up of 3 layers, which due to the sol gel technology, gain enormous adhesion to the body of the utensil and are almost impossible to detach with use. The smooth surface makes food easy to peel off. The handles, with Stay-Cool technology in wood look, are designed with a non-slip surface and remain cold even after hours of use. The durable tempered glass lid ensures continuous eye contact during cooking while the silicone perimeter rim makes the lid completely silent in use; its special channels release the steam from the pot when the food boils. 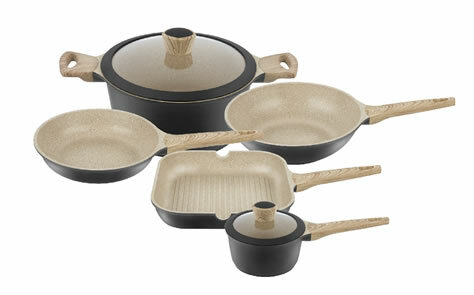 Granite series cookware are the ideal solution for everyday cooking, with practical features and high quality. Her mission? The smile of those you love! Durable body made of high quality cast aluminum 3.6 mm thick, with excellent thermal conductivity for maximum performance and uniform cooking. The 3-layer sol gel non-stick coating is of top quality, while the anti-slip handle with the wooden look stays cool even after hours of cooking. Premium quality tempered glass lid. Suitable for every type of cooker (including induction) & easy to clean in a dishwasher. Reduces odors and droplets from frying! Made of premium quality tempered glass and Bakelite handle for comfortable grip. Fits on all cooking pots, casseroles and pans. Featuring ventilation holes for crispy frying and pressure relief during boiling. Easy to clean in a dishwasher. Cooking at its Best! Durable body made of high quality cast aluminum 3.6 mm thick, with excellent thermal conductivity for maximum performance and uniform cooking. The 3-layer sol gel non-stick coating is of top quality, while the anti-slip handle with the wooden look stays cool even after hours of cooking. Suitable for every type of cooker (including induction) & easy to clean in a dishwasher. Packed with features to help you prepare delicious recipes Durable vessel made of 3,6mm thick aluminum. Superior thermal conductivity for efficiency and even cooking. Premium quality TEFLON CLASSIC non stick coating guaranteed by Du PONT Stay cool Bakelite handles, comfortable through hours of stovetop cooking. Heat resistant glass lid. Suitable for electric, ceramic, gas and halogen cooking appliances. Easy to clean in a dishwasher. Eco friendly and 100% recyclable. Packaging waste is recycled through the collective system of the Hellenic recovery recycling corporation. Manufactured in Greece by PALAMIDIS SA. Safe for contact with food. The company applies a quality control system according to the EN ISO 9001 2008 standard. PAL GRANITE Series Glass Lid Reduces odors and oil spray from frying Made of premium quality tempered glass Includes a peripheral silicone RIM for a snug and quiet fit With a comfortable Bakelite handle Fits on most cooking pots, casseroles and pans Featuring ventilation for crispy frying Safe for contact with food Easy to clean in a dishwasher. Eco friendly and 100% recyclable. Packaging waste is recycled through the collective system of the Hellenic recovery recycling corporation. Designed and assembled in Greece by PALAMIDIS SA. Safe for contact with food. The company applies a quality control system according to the EN ISO 9001 2008 standard. For easy, fast and healthy cooking! Durable body made of high quality cast aluminum 3.6 mm thick, with excellent thermal conductivity for maximum performance and uniform cooking. The 3-layer sol gel non-stick coating is of top quality, while the anti-slip handle with the wooden look stays cool even after hours of cooking. Suitable for every type of cooker (including induction) & easy to clean in a dishwasher.